Ornamental plants can both decorate our landscape and serve a purpose. This picture–taken March 21, 2013– illustrates my point perfectly! This year the environment provided optimum conditions for beautiful Spring color! Each of these trees provides shade and a privacy screen. Ages are; redbud (7 years), oak (6 years), Arizona Cypress (5 years). 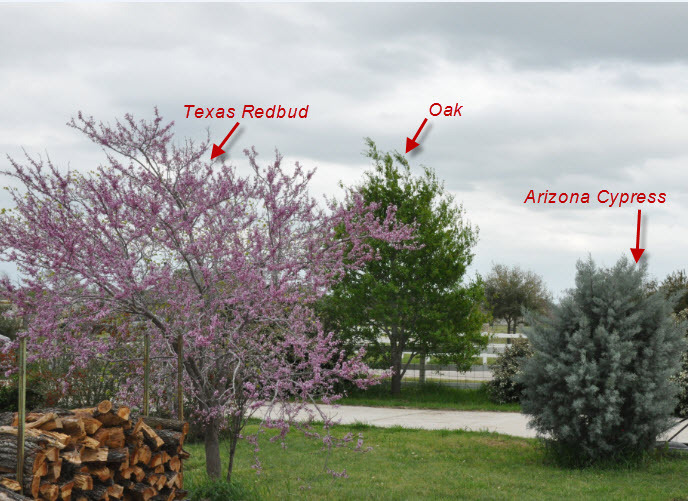 Each Spring provides a beautiful compliment of colors–in Summer, the redbuds are leafed out (green), and the oak leaves fade, and the arizona cypress fades slightly.